ASE stands for Automotive Service Excellence. It is an independent, non-profit professional certification group that certifies professionals and shops in the automotive repair and service industry. Since 1972, ASE has been working to improve the quality of vehicle repair and service by testing and certifying vehicle repair and service mechanics. With over 40 tests for cars, light trucks, collision repair, medium-heavy trucks, buses, and auto and truck parts, ASE helps maintain high standards to protect consumers. Automobile technicians must keep their skills and knowledge up-to-date to keep pace with ever-changing vehicles and technologies. The tests focus on practical problems encountered in day-to-day work situations and is written and approved by teams of carefully selected experts who represent a cross-section of relevant industry representatives. Selecting such a wide group of experts ensures the tests are fair for all without bias towards a specific vehicle type, make, or equipment manufacturer. At Pep Boys, we are proud to have technicians certified by the National Institute for Automotive Service Excellence working on your vehicle. 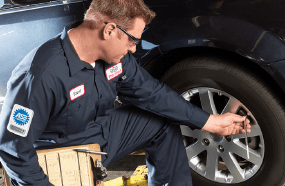 When our customers bring their vehicles to Pep Boys, they can feel confident that the professionals working on their vehicle are experienced, educated, and constantly improving their skills. Need professional service on your vehicle? Experience the Pep Boys difference today by dropping by your local Pep Boys or scheduling your next service appointment online.